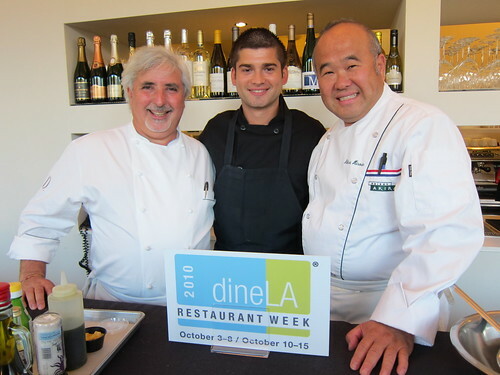 Last Thursday, merely the day after Blogger Prom, I joined Josh Lurie of Food GPS and Chef Ben Bailly of Petrossian West Hollywood in judging the second of four Quickfire Challenges hosted by Dine LA in promotion for their upcoming restaurant weeks. The challenge was cold soup, and it was a contest of the Italian and French schools of culinary arts. 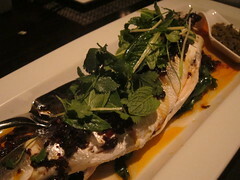 Fifteen minutes were allowed and the “surprise” ingredient was Alverta President caviar – a premier, new American strain of caviar. 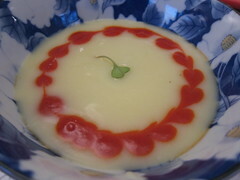 Chef Akira Hirose prepared a potato leek soup that had much of its treasures buried at the bottom. We, the judges, were instructed to go to the bottom to scoop up the essence of everything that was in the cold soup. And, so we did. 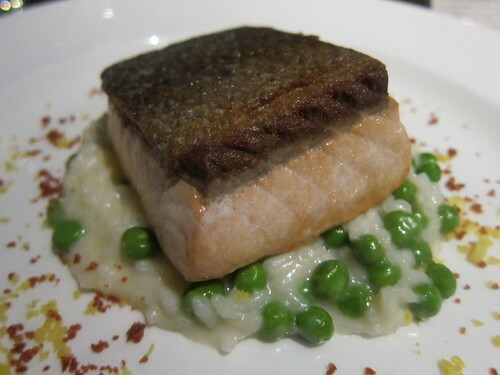 The salmon was perfectly smoked, the yuzuÂ packed a refreshing citrus punch, the hazelnut and potato leek carried weight, and the thick soup had great complexities overall. The piquillo pepper that dotted the soup was a nice touch, spicing up the soup a tad. 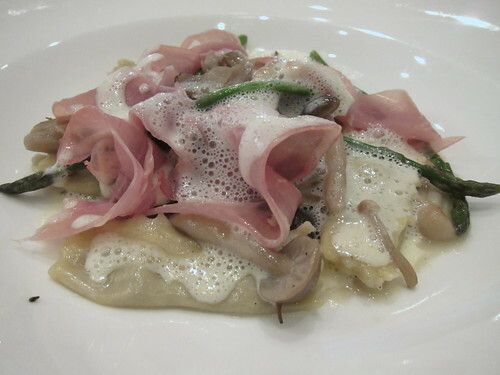 Alas, it was then time to try Chef Celestino Drago’s creation. True to form, it was a cold gazpacho incorporating the juices of fresh, yellow and red heirloom tomatoes. Cucumber juice provided a bit of green color and rounded out the sweetness of the tomatoes. 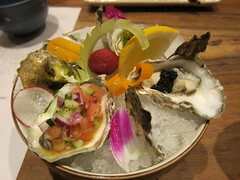 The juices enveloped a bit of guacamole – the weight in this soup – along with orange zest and yuzu in the martini glasses, which further brightened the concoction. 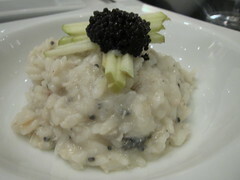 Then came the caviar and diced cucumber. Basil oil was drizzled and croutons were floated atop the cold soup. Though this was not as unique as Chef Hirose’s soup, Chef Drago’s was the winner in my camp. 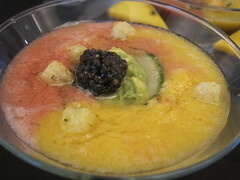 I really enjoyed the flavors all the different juices – and even caviar – brought to the table, and while gazpacho is a common menu item in Italian menus, I thought this was a well-executed dish. But the beauty of having three judges is that if not unanimous, a winner would be determined by two, and I was ultimately outvoted by Chef Ben and Josh. 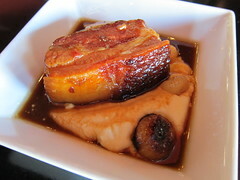 They favored Chef Hirose’s cold potato leek because of its complexity. There was speculation that Celestino was outnumbered by those from the French camp. Me – I was content to be outnumbered and stood by my decision. I myself skewed toward the lighter soup since I prefer my cold dishes without a ton of weight, but also thoroughly enjoyed Chef Drago’s gazpacho. 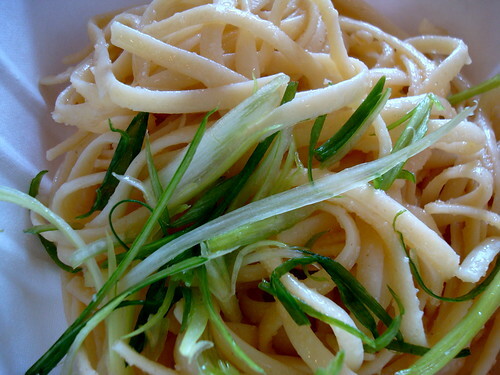 And so continues the Dine LA Quickfire Challenges… Stay tuned for today’s rendition: Cold Noodles. 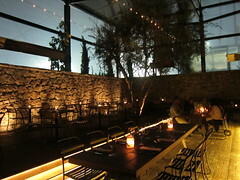 It also comes complete with sneak preview of Starry Kitchen Dine LA dishes for $5 a pop and an after-party at CASA. 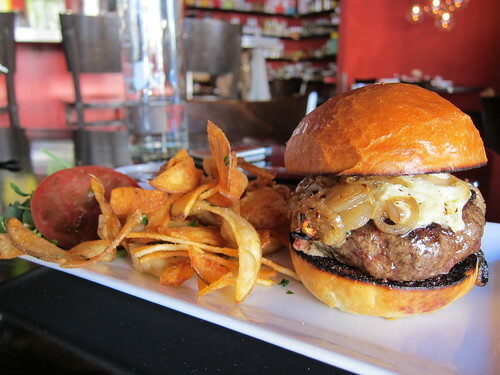 Quickfire Challenges don’t only happen on Top Chef. And in celebration of the upcoming Dine LA weeks, there are themed challenges happening all over the city. Yesterday, Mark Peel of Tar Pit and Campanile defeated Ben Ford (Ford’s Filling Station) and David LeFevre (Water Grill) with a Guinea Hen dish. 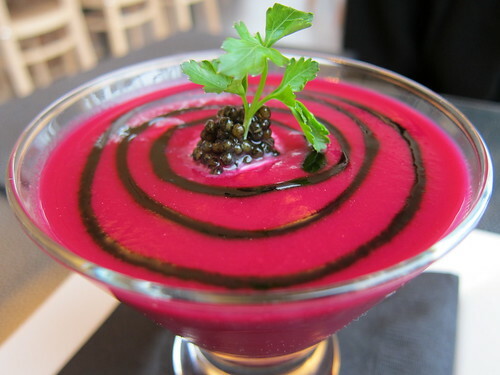 Fortunately, there are three more challenges and I will have the honor of being a judge of the “cold soup” Quickfire Challenge to take place tomorrow at Petrossian – the caviar boutique and restaurant in West Hollywood on Robertson. 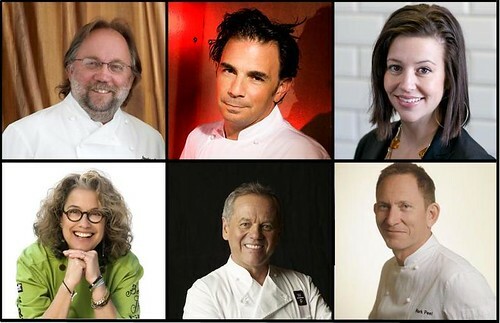 The other judges will be Chef Ben Bailly, Petrossian’s chef and Josh Lurie of Food GPS. In this challenge, we’ll see Chef Akira Hirose, Maison Akira Owner/Executive Chef go up against Chef Celestino Drago, Chef Drago Restaurant Group Owner/Executive Chef. The winner will go up against the other three winners of the other challenges in early October in a finale (TBD). So I hope you can come and attend what promises to be a very exciting challenge. It’s going to be fun, exciting and a close contest, for sure. …Now where is my cold soup? 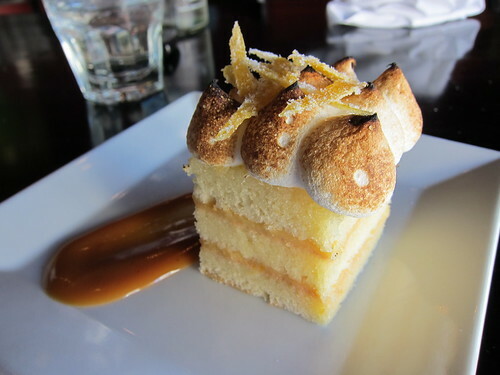 My girlfriend and I had a reservation at Petrossian WeHo on the last day of Dine LA. 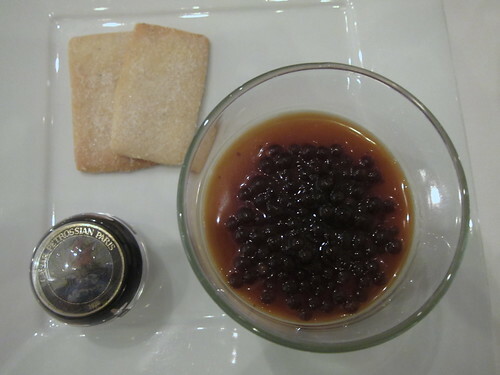 It wasÂ my long overdue date with PetrossianÂ and it ended up falling on a day El Nino came out to play. Light rain, grey skies, black umbrellas and puddles on the ground as we zig-zagged into the Robertson boutique. 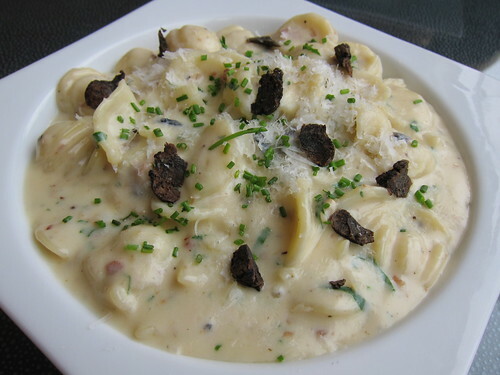 We had both already studied the menu andÂ decided on the Black Truffle Mac ‘n Cheese. With bacon. The weather solidified our desire for comfort, and that day we’d start from the belly, up. But I am ahead of myself. 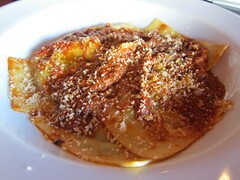 We had indulgent blinis, first. 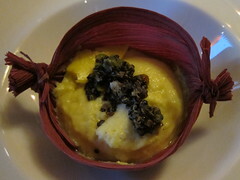 No bellinis, that is – though I did have a glass of hibiscus champagne, complete with edible flower at the bottom. 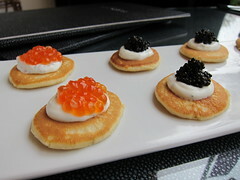 But back to the blinis, which wereÂ topped alternately with salmon roe, Transmontanus and trout caviar – each pancake perfectly fluffy and each egg providing bursts of flavor atop dallops of creme fraiche. We were ready for more. Our second appetizers were the borsht and wild mushroom cappuccino ($10 ea)Â – the former of which was lauded in yesterday’sÂ Tasting Table and rightfully. I almost envied my girlfriendÂ as she spooned mouthful after mouthful out of herÂ electric martini glass…with each bite pleasantly cold despite the weather – so as to not mess withÂ the integrity of the live dish. Who knew beets could be so indulgent and subtly tangy? It was perfect, and topped with more Transmontanus. I would have held more envy if I weren’t so pre-occupied with my foamy wild mushroom cappuccino. Indeed, it was not soup, but a cappuccino. It was served hot, steamy and frothyÂ and I justÂ couldn’t put the spoon down. The richÂ creamy-ness comforted my tongue as I bit on each crouton with each spoonful seasoned with micro green onions and paprika. 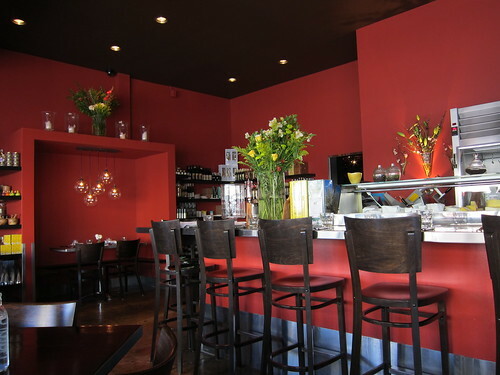 “Cappuccino sounds more luxurious,” Chef said. I agreed. Foam is an attribute. And then came our main lunch entrees. Chef Ben Bailly, whom I’ve had the pleasure of running into a few times around town, visited with us from the kitchen and at my inquiry, insisted the bacon in the mac ‘n cheese was listed on the menu.Â Apparently, I had an appreciatinglyÂ selective memory this time around, because it was such a pleasant surprise when I tasted it along with the incredibly rich cheeseÂ and black truffles. I wanted to eat it all. I could only eat enough to barely make a dent since our appetizers were solid and the dish was so rich – in the very best way. I have to say, though, that IÂ had never been so excited for leftovers in a very, very long time. Even the leftovers were the best mac ‘n cheese I had ever had. Dine LA may be over, but the dishes are still there. Whether for the borsht, blinis, black truffle mac ‘n cheese ($18) or to try the foie gras creme brulee with fig marmelade ($14)Â -Â I’ll be back at Petrossian. 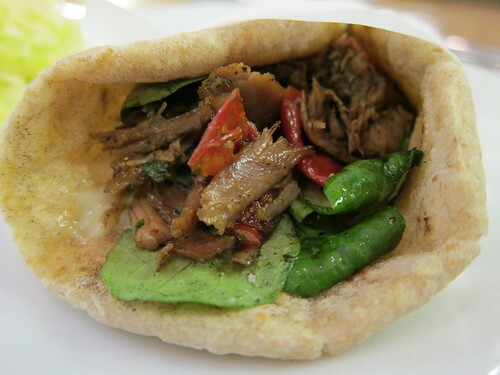 Next up is dinner – not excepting many more lunches in between.